PA media outlets claim IDF forces converging on home owned by father of Israeli-Arab terrorist who murdered Rabbi Itamar Ben-Gal. 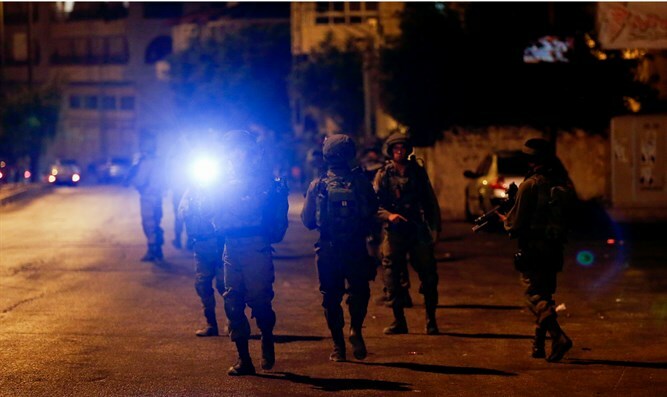 Israeli security forces have surrounded a private home in the Palestinian Authority-controlled city of Shechem [Nabulus) Tuesday evening, and are closing off nearby roads, PA media outlets have reported. The operation is apparently part of the ongoing manhunt for 19-year-old Israeli-Arab terrorist Abed al-Karim Adel Assi, who murdered 29-year-old Rabbi Ben-Gal at a hitchhiking spot in Ariel in Samaria Monday afternoon. The son of an Israeli-Arab mother from Jaffa and a PA-resident from Shechem, the terrorist reportedly frequented his father’s home city. According to Arab media reports, the home targeted by the IDF operation is owned by the terrorist’s father. Dozens of Arab rioters have gathered in Shechem, throwing rocks and other objects at Israeli security personnel. Earlier on Tuesday, Prime Minister Binyamin Netanyahu vowed that the terrorist from the Ariel stabbing attack would be brought to justice. Earlier Tuesday morning, Israeli security forces eliminated Ahmad Nasser Jarar, the terrorist who headed the cell that murdered Rabbi Raziel Shevach. Rabbi Ben-Gal was laid to rest Tuesday morning at a cemetery in his hometown of Har Bracha, in Samaria. Over 1,300 people gathered to pay their last respects, including Knesset Speaker Yuli Edelstein, Minister Uri Ariel, and several MKs.